The folks at Alphabet's Google Cloud Platform would like you to know that the platform is as finely tuned as an Indy racecar. GCP said this week that latency is down and throughput is up by a considerable amount with the 2.1 release of its cloud SDN Andromeda. Announcements like this are important to GCP, as it struggles to take a place alongside public cloud leaders Amazon Web Services and Microsoft Azure. Although numbers released in August show the company improving its market share in the neighborhood of 40 percent, it remains a distant fourth place runner, behind IBM, with a 5 percent share of the total public cloud market. Andromeda is the software-defined network stack that underpins Google's cloud, serving as the base for delivering Cloud Platform services. All of GCP's firewalls, routing, and forwarding rules leverage the Andromeda APIs and infrastructure. When first released in 2014, GCP touted Andromeda 1.1 as a performance-enhancing feature that set its cloud apart from others. Benchmarks the company published at the time indicated the platform increased single-stream throughput by 1.5X, or 3X for 200 streams. With version 2.1, GCP is advertising a conditional 47 percent throughput increase when compared to version 2.0, which is presumed to be much improved over early 1.x versions. Most impressive are Andromeda's latency numbers. 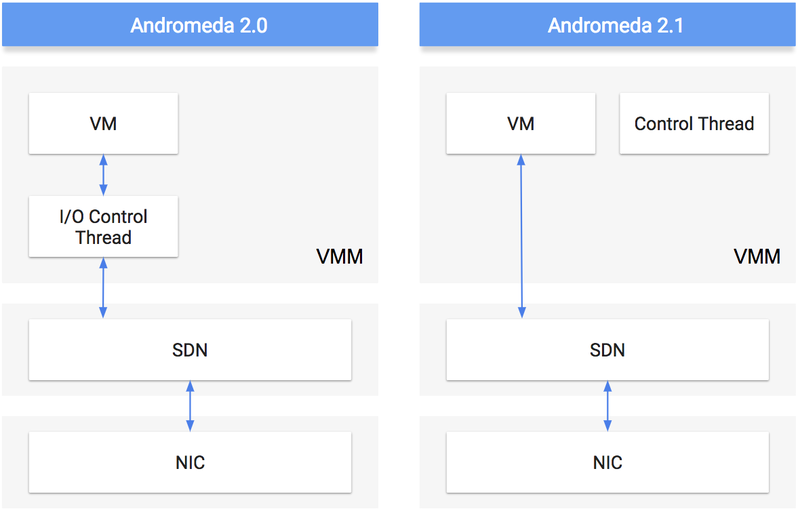 According to GCP's benchmarks, the new version reduces network latency between Compute Engine VMs by 40 percent over Andromeda 2.0 and by nearly a factor of 8 since Andromeda was first launched. Lowering latency is becoming an important issue for all cloud providers, especially as computing moves toward latency-sensitive workloads involving connected devices on the edge. Low latency can also be an important consideration for financial transactions, ad-tech, video, gaming, and retail, as well as workloads such as high-performance computing applications, memcache, and in-memory databases. Jake Adriaens, a software engineer at GCP, pointed out in a blog post that Andromeda's latency improvements are the result of changes made in the way the system works on a core level. "Andromeda 2.1 latency improvements come from a form of hypervisor bypass that builds on virtio, the Linux paravirtualization standard for device drivers," he explained. "Andromeda 2.1 enhancements enable the Compute Engine guest VM and the Andromeda software switch to communicate directly via shared memory network queues, bypassing the hypervisor completely for performance-sensitive per-packet operations." In layman's terms: the VM no longer has to go through town, with its stoplights and heavy traffic, in order talk to a driver. Adriaens also explained that Andromeda, being software defined, will benefit customers behind the scenes, because its agility will allow the cloud company to roll out new features on the fly. "With SDN, we can quickly develop and overhaul our entire virtual network infrastructure," he said. "We can roll out new cloud network services and features, apply security patches and gain significant performance improvements. Better yet, we can confidently deploy to Google Cloud with no downtime, reboots or even VM migrations, because the flexibility of SDN allows us to thoroughly test our code." Thursday's announcement came only two days after the cloud provider announced improved performance and expanded availability for customers connecting directly to GCP through its Dedicated Interconnect service.